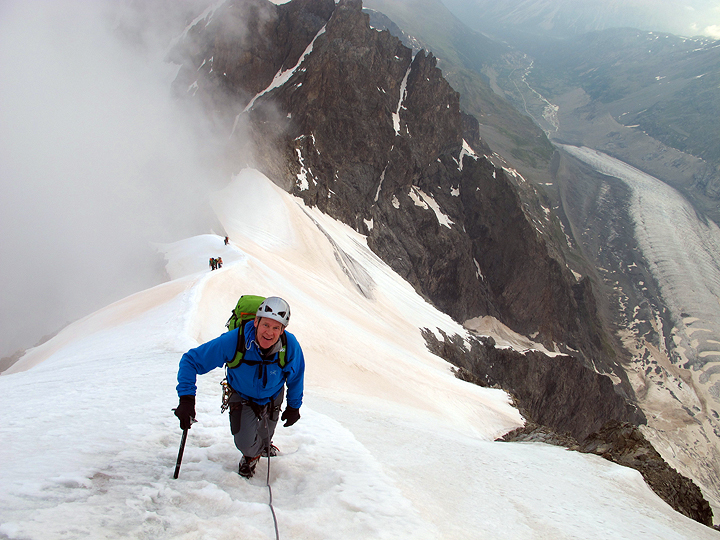 Grant Carnie, from Colorado, spent part of his summer vacation time with Mark in another week of Alps Classics. 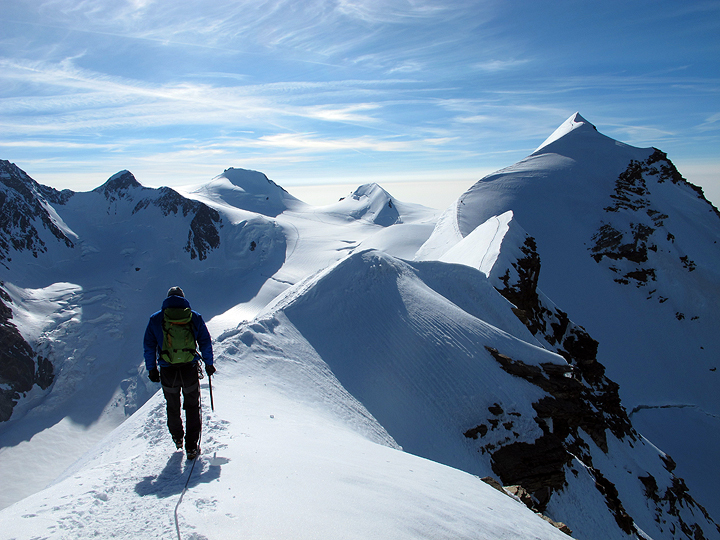 We started with a traverse of the Liskamm peaks (which we were forced to miss last year), and then continued on to Switzerland's Engadine in the hopes of climbing the Bianocgrat, Piz Palu and Piz Badile. Checking out the route on the start of the hike into the Sella hut, Day 1. We left Chamonix at a rather leisurely 9 or 10 in the morning, drove to Gressoney, rode the lifts up to the Bättforko and hiked up the remaining 800 meters to the hut. Leaving the hut, early in the morning. We arrive on the West summit at about 8 in the morning, a perfect day. Looking east towards the central summit. 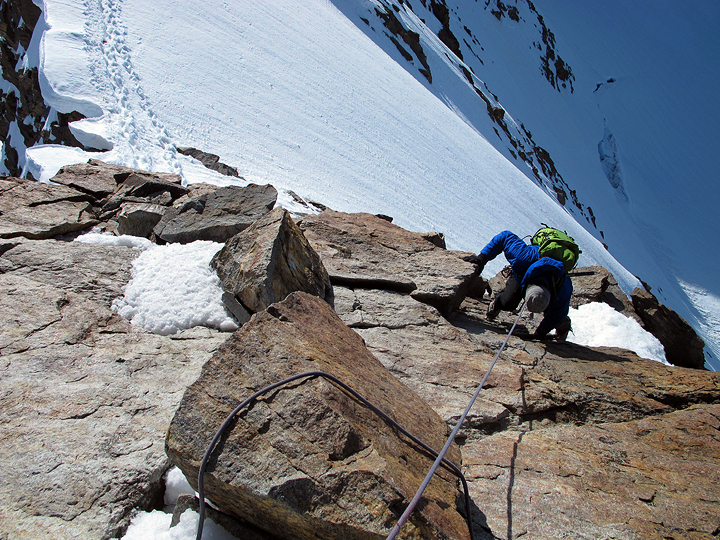 The next 150 meters of traverse are the most exposed on the route. A short downclimb on a rocky step. We are now past the most challenging part and have relatively easy going for a while. Looking back towards the west summit from the low point between the summits. 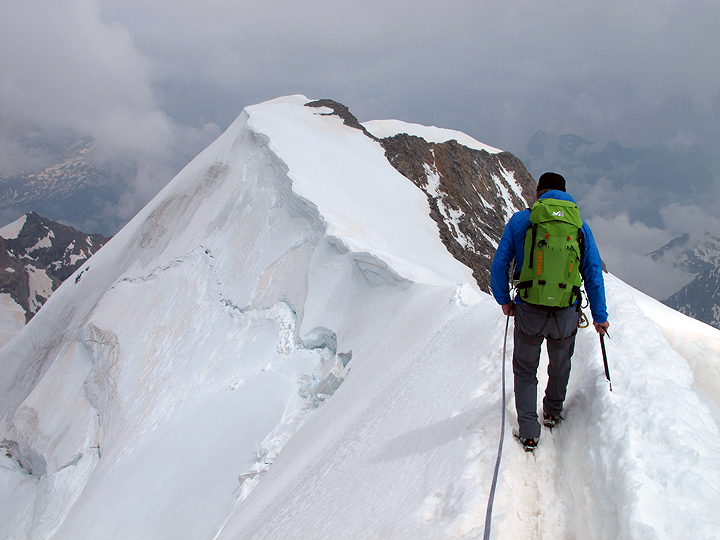 Descending off the main summit. Looking east. 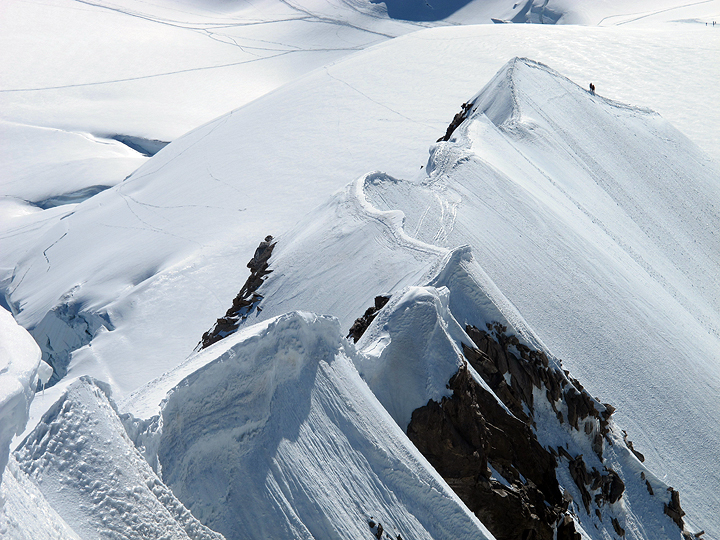 The amazing convoluted east ridge of the Liskamm. 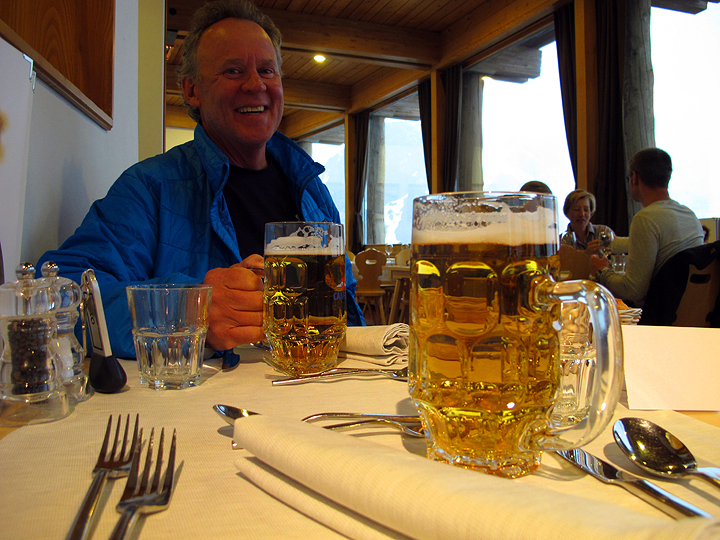 Our day continued with a descent to the Lisjoch, and on down to Punta Indred and the lift system back to Gressoney. We spent the night in a hotel in the valley. Very nice. 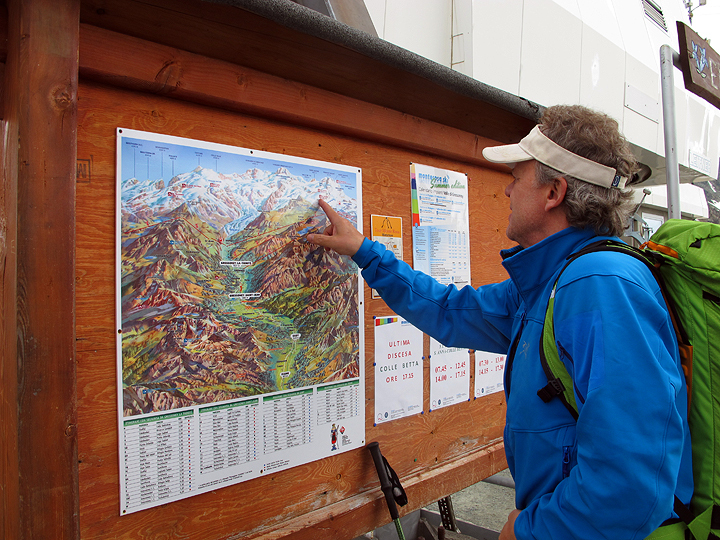 The plan for Day 3 included the drive to Pontresina in the Engadine, then onward to the Tschierva hut. 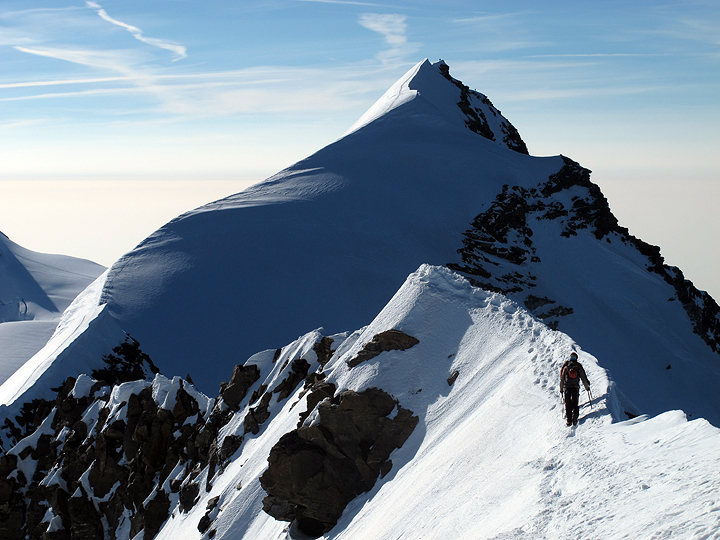 Our goal was to then climb the Biancograt on Piz Bernina on Day 4, continuing on over Piz Palu, and overnight at Diavolezza, a very long day indeed. Move the scroll bar for a long panorama. 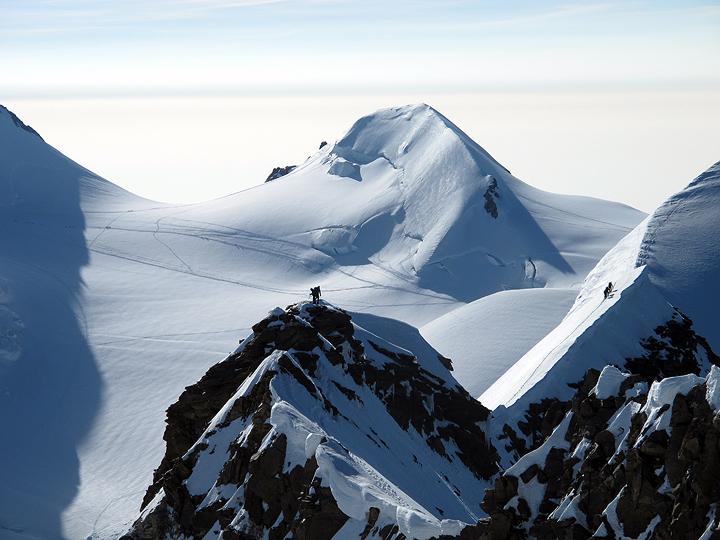 The summits of Piz Palu on the left with the Piz Bernina in the center of the long image. The Biancograt is the right skyline of the Bernina. Piz Morteratsch is on the right. 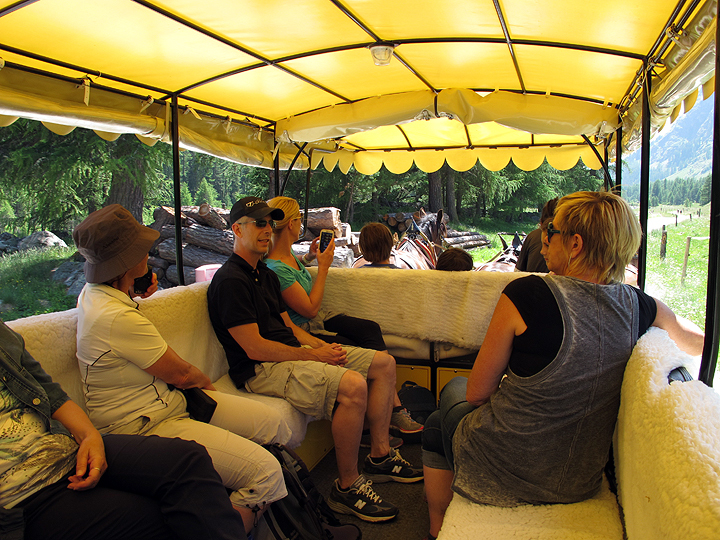 Riding the horse carriage into Val Roseg, the first stage of the trip to the Tschierva hut. Breakfast at 3 am, and then out into the cool night. 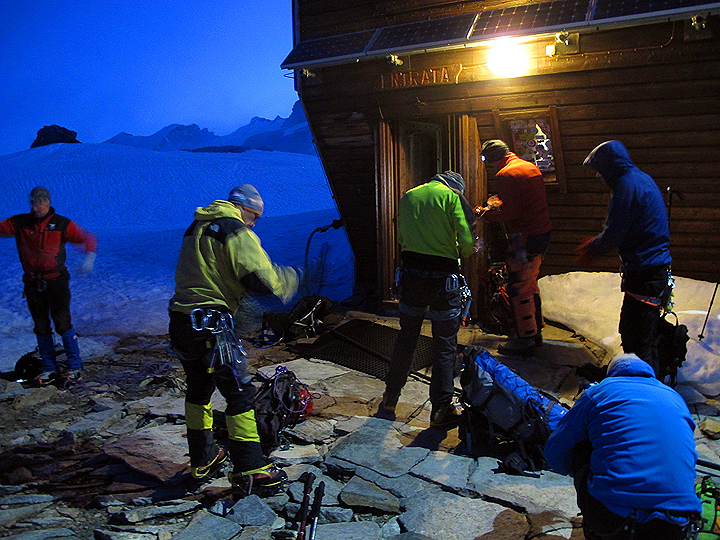 At about 5 in the morning we reach the rope-up spot and put away the headlamps. On the Biancograt proper. 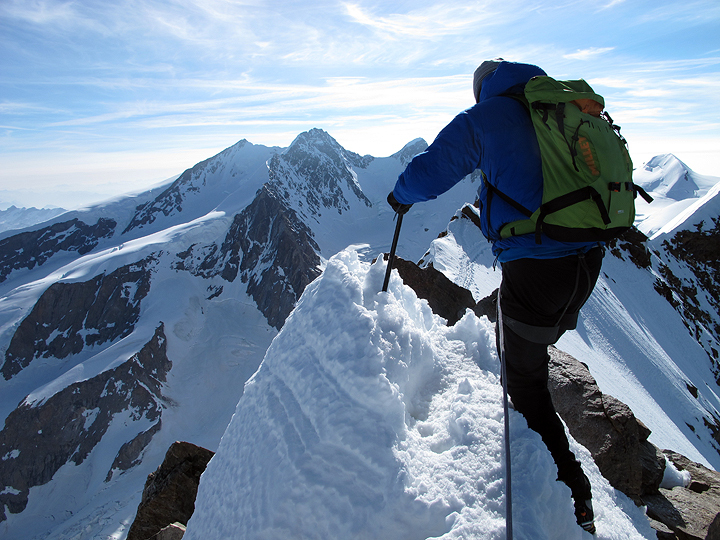 The snow ridge ends at Piz Bianco, 3995 meters. 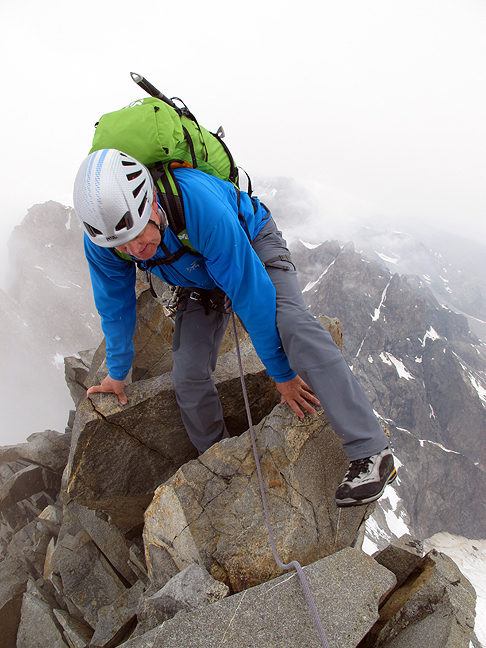 We reach the summit of Piz Bianco at about 8:15 am. 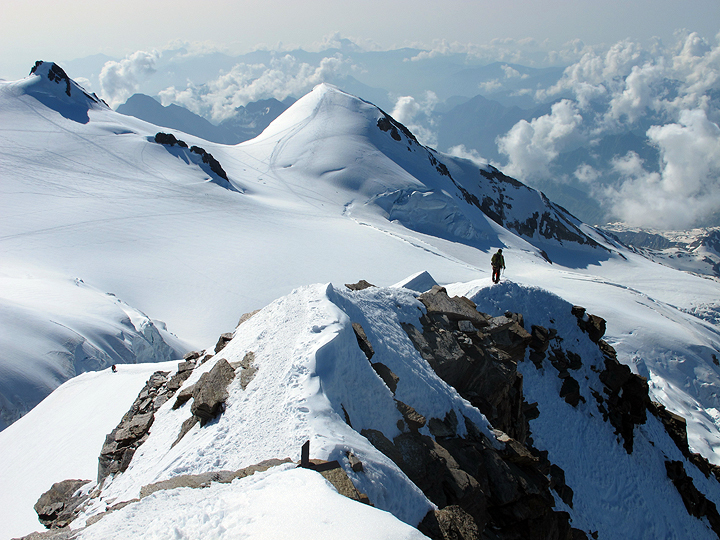 The rocky section between Piz Bianco and Piz Bernina summit. 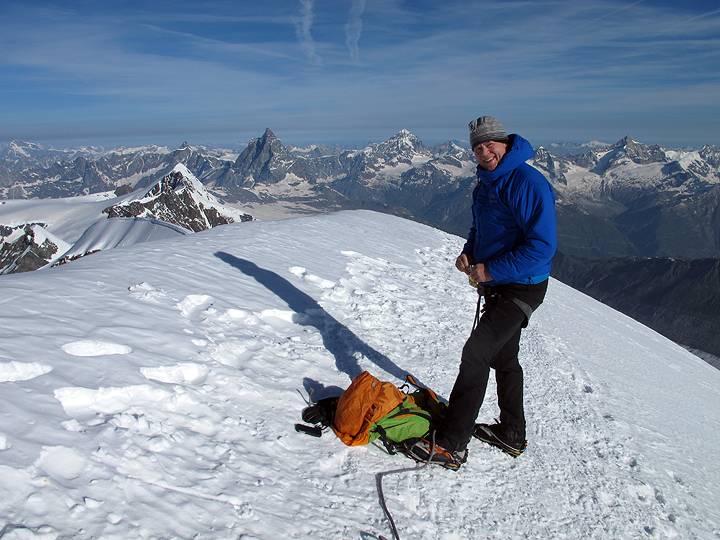 About an hour and 10 minutes later we are on the summit of Piz Bernina. The weather had been in and out of cloud for most of the day, and we even had a few drops of rain on the summit. 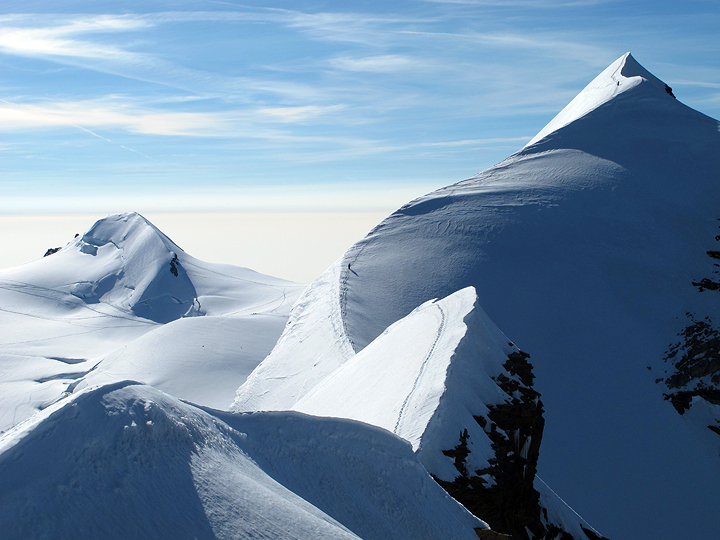 But it seemed as though nothing very nasty was developing, so we continued with our ambitious plan of traversing the summit of Piz Palu on the way to the Diavolezza. 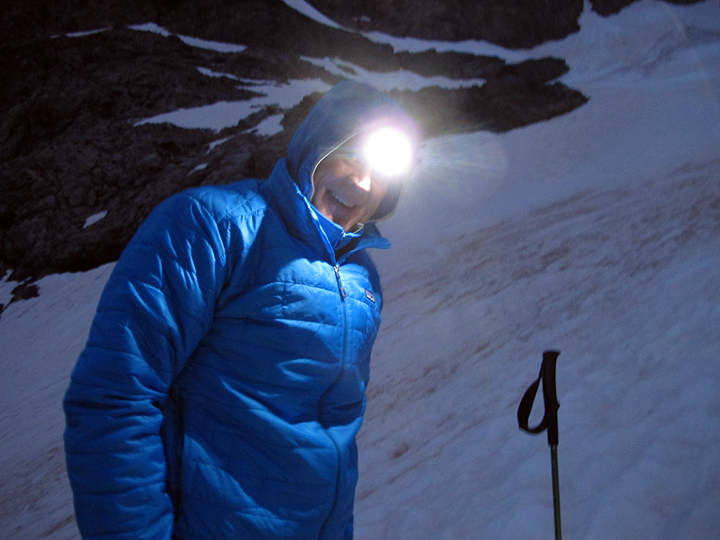 Finally, in the Berghaus Diavolezza, showered and soon to be "watered". A long day, some 13 and a half hours. 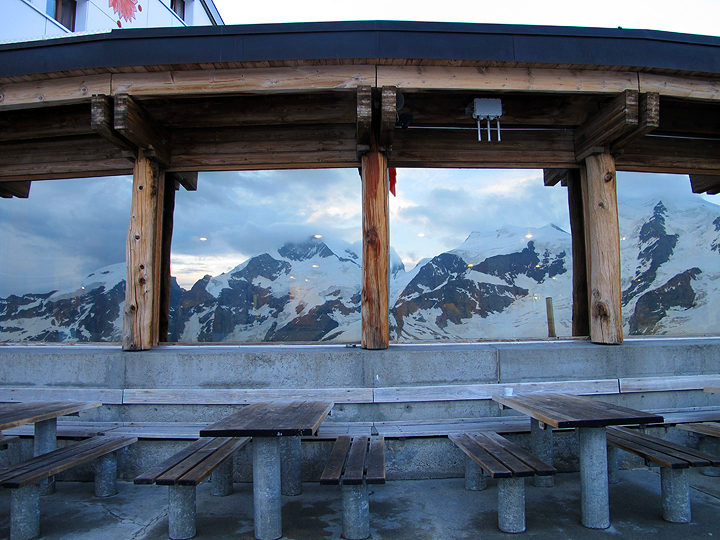 The reflection of the summits of the Bernina group in the Diavolezza windows. 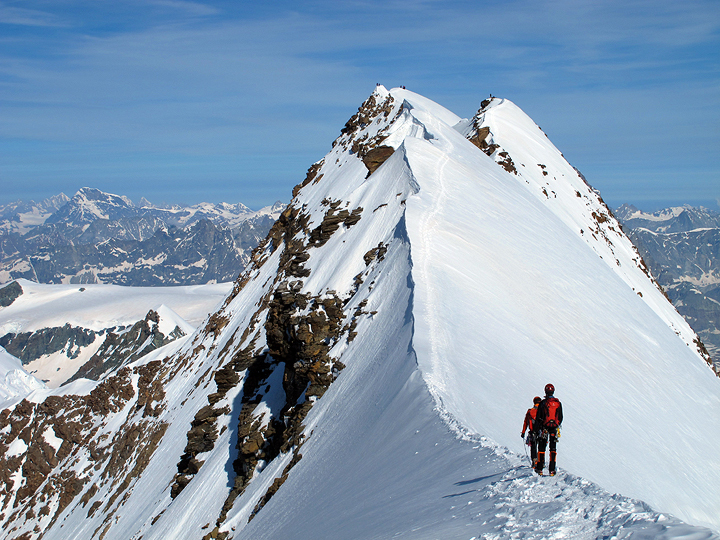 Our hope was to continue with the Piz Badile. 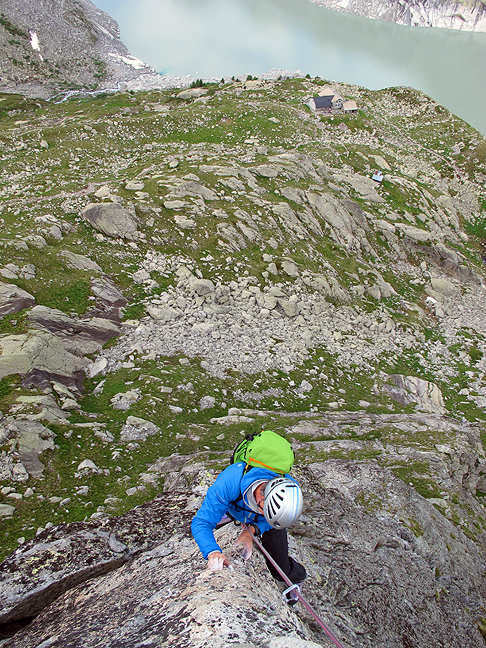 However, with too much afternoon thunder-storm activity, we opted for the less committing climbing from the Albigna hut. 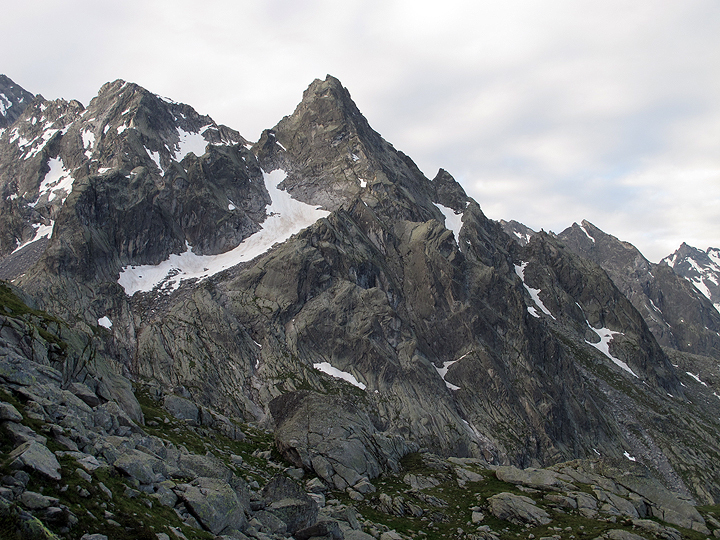 This, the Punta Albigna, was our first climb, which we did the day we hiked into the hut. Mouse over to see the route, Moderne Zeiten (Modern Times). We actually only climbed the lower section, as we were concerned once again about afternoon rain showers. The next day, we wanted something quite short, as Grant had an important rendezvous in the early afternoon. 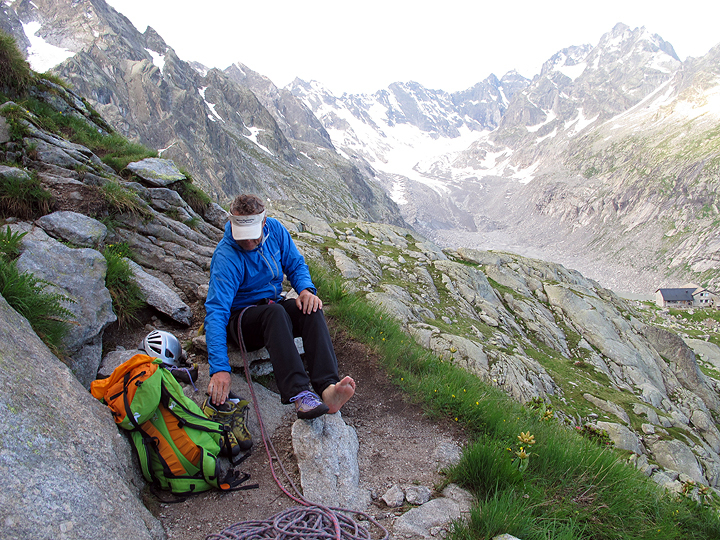 Here we are changing shoes at the base of the Torre de Piz dal Pal. 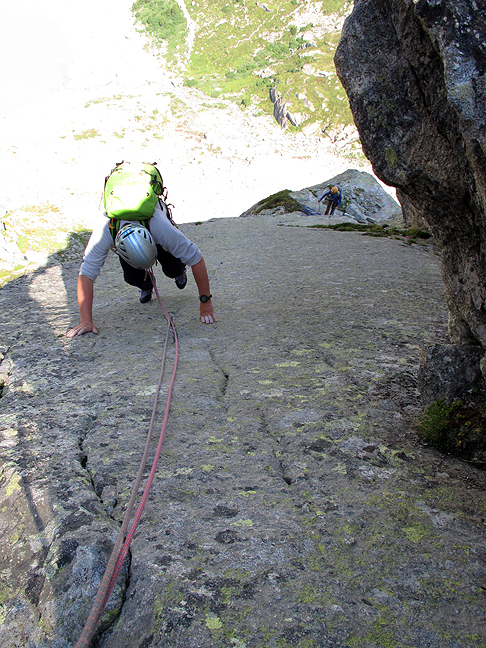 The night-time rains had not quite dried off the rock, so we had a bit of more delicate footwork ahead of us. 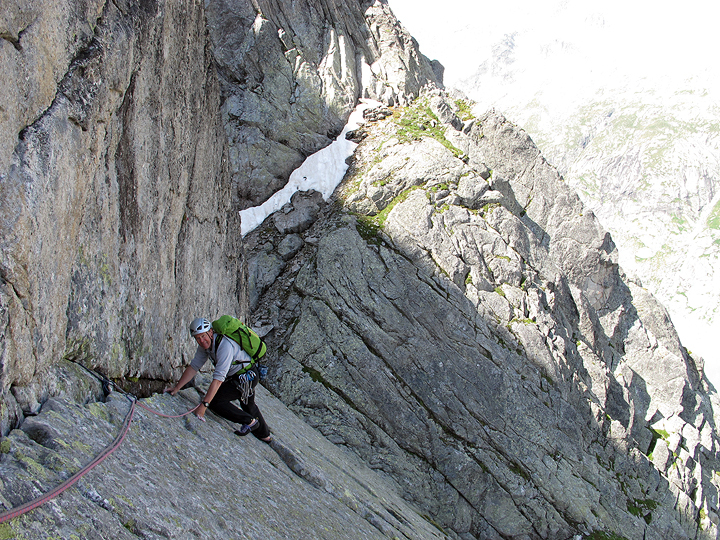 The last few moves of the Torre de Piz dal Pal. The Albigna hut can be located by its dark roof below.